The CC is an Award Winning hidden little gem in Canvey Island. It is proud to be one of the busiest bars in Essex and is now supplied by the three biggest breweries in the UK; a true “free house”. The club has 5 stars from the local council and has received an award for the quality of its beer, with prices starting at £3 a pint. OK, we'll admit we don't look stunning from the outside, but once inside you'll be shocked at just how gorgeous we are. People are amazed how much "personality" the bar has, considering it was only re-built just a few years ago after a fire that started in a neighbouring property burnt the old club down. A fun and friendly bar with the best entertainment in town, dancing a plenty and lots of banter. 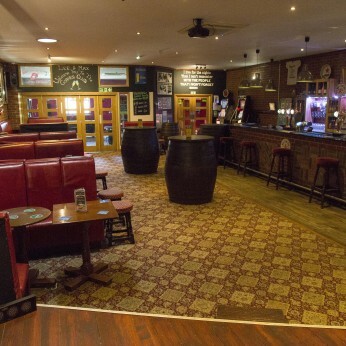 There's always something going on at the CC; Monday is £2 a pint for members, Tuesday is one of the busiest and best quiz nights around with quizmaster extraordinaire, Bobby Sox, Wednesday we promote Gin & Cocktails and Thursday we run a drink promotions on mainline spirits... We host live music every single weekend. Not forgetting our annual Newmarket Race Day. a fantastic and very popular day out with our Members..
PLUS, we are the official home of MONKIES WEDDING, probably one the most popular SKA bands around right now. £20 bar credit up for grabs for winners and many boobie prizes..
We also have a £1 bonus ball question with winnings up to £200. A local duo who will be giving us a fantastic tribute show of Fleetwood Mac and Santana...we look forward to welcoming them back after their tour abroad.. Drinks Promotion... Double up on mainline spirits* for the price of a single. Ask staff for details..
Christmas Eve & New Years Eve we are open until 2am. We also have around 12 late licences a year for special events. Sheila is now doing roast dinner's on a Sunday from 1pm. Last orders 4pm.